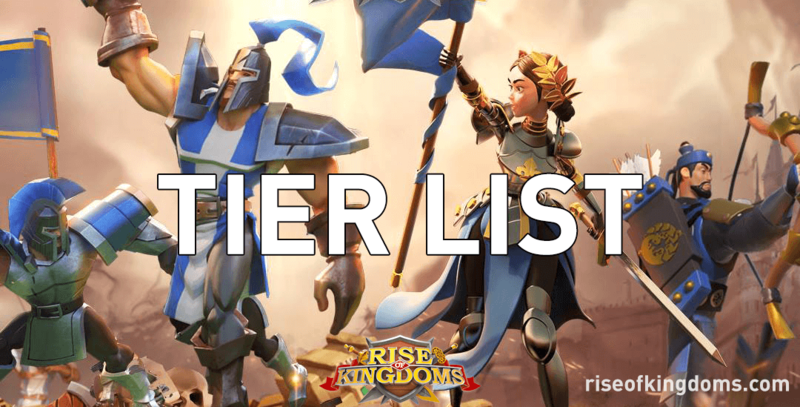 Finally, after a long time waiting, this is the Ultimate Commander Tier List for Rise of Kingdoms! Brought to you by Chisgule Gaming. 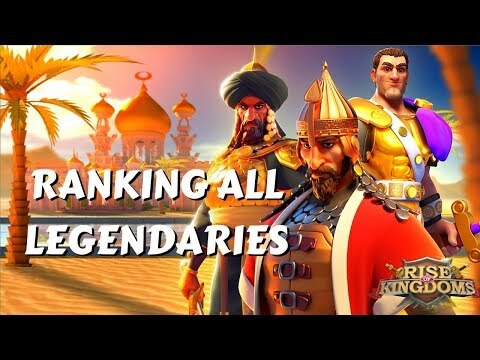 Being divided into different categories with detailed explanation, you will get a lot of of interesting information and easily know which commanders you should focus on during the current game meta. Tier List updated on April 13th 2019. 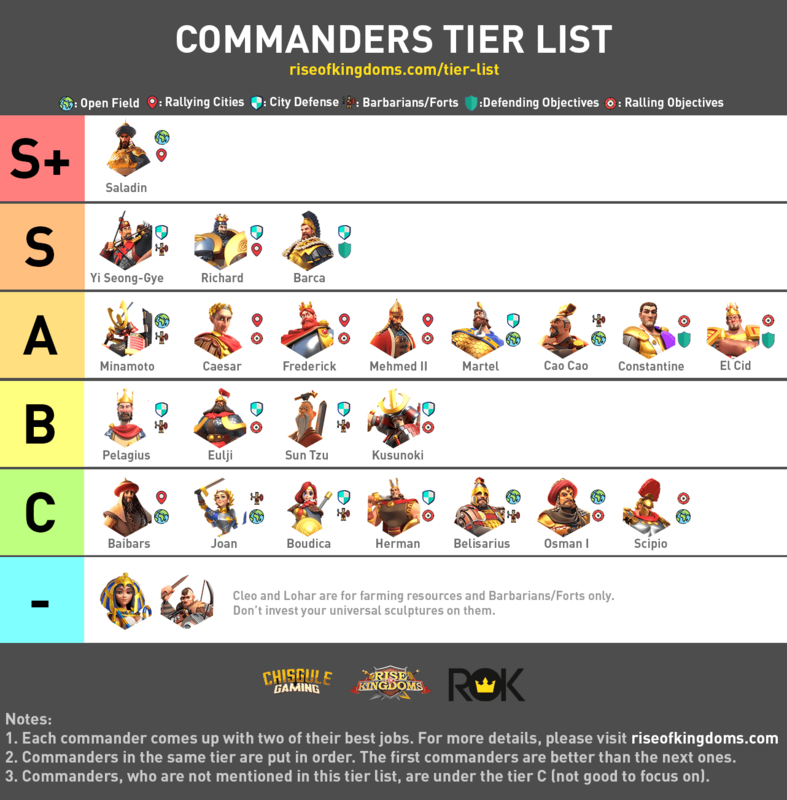 The intention of this ULTIMATE TIER LIST is to help you decide which commanders you want to INVEST in. It reflects my OPINION of each commander’s efficacy in multiple scenarios. The overall rating is far less important than the rating for each specific scenario. When selecting commanders you should choose based on what scenarios you want to excel in. Although it would be interesting to make separate lists for when the commander is primary and secondary, we’ll have to save that for potentially another day. 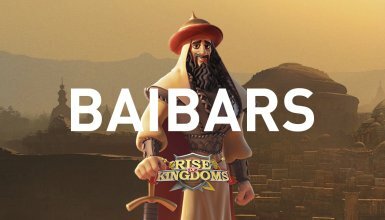 With regard to open field combat, there are several factors that make a commander great: Move Speed, AOE, and number of troops. I heavily prioritize move speed over other factors because if you can’t control your position, you can frequently be either irrelevant or just dead. One consideration that went into these rankings is the talent trees available to each commander. A Absolutely use this commander! 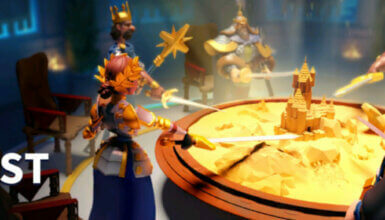 B Better than most other commanders! C Could be better, use a different commander! D Don’t use this commander! 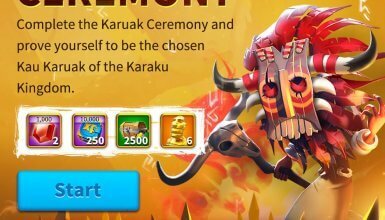 F Freakin’ don’t use this commander! Saladin S+ B B- S+ S A+ / B+ A+ / B+ Cavalry / Mixed, Ratings for each category are as-if he’s NOT countering the enemy – if he is, each rank goes up a tier. Cleopatra For farming, don’t invest universal sculptures in Cleopatra, really. Feel free to comment below and show us your own opinions regarding to how the tier list should be!